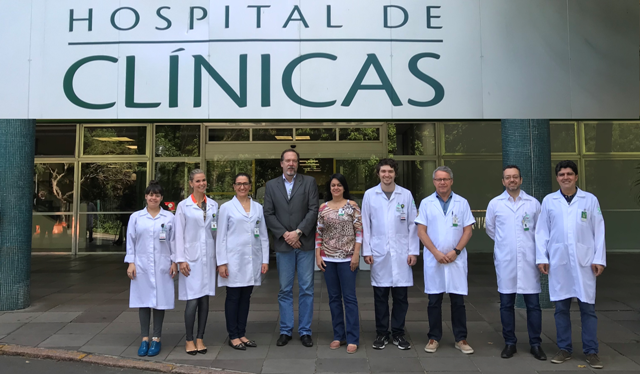 The Hospital of Clinics of Porto Alegre (HCPA) developed a work on the justification, in joint action of the services of Medical Physics and Radiology, in the clinical and surgical specialties. The actions implemented are based on the training of professionals in medical and dental services, use of IT tools in the request of exams, institutional campaign and elaboration of the Guide for Request for Diagnostic Imaging Exams. With the promotion of these actions, the team’s awareness of the importance of the medical justification in the exam request was perceptible. Tiago Severo Garcia, professor of medicine at the Radiology Service /UFRGS. For the translation of the Guide for Requesting Diagnostic Imaging Examinations, the workgroup, in addition to receiving the participation of other members of the medical team of the HCPA Radiology Service, also counts on the contribution and guidance of Dr. Bárbara Rodrigues and Dr. Marcello Gonçalves from the National Nuclear Energy Commission (CNEN). Interview with the team of the Hospital of Clinics of Porto Alegre. How did you decide to act with Action # 1 in Bonn Call for Action? The International Atomic Energy Agency (IAEA), entitled Triple A – Awareness, Appropriateness and Audit, promotes Awareness, Appropriateness, and Audit in health services around the world. The justification is the adequate means to guarantee the reflection about the real necessity of the exam that will be requested, avoiding unwanted exposures in patients and professionals, besides being one of the Principles of Radiological Protection and a legal obligation foreseen in Administrative Rule 453/98-MS. This concept was strengthened in 2012, in Action # 1 of Bonn Call For Action. Regarding Awareness, doctors who request exams should be aware of the risks that may occur due to exposure. In this way, it is necessary that these professionals be trained by competent professionals. Adequacy is related to the need for the exam, that is, its execution must be justified. A patient should only be exposed to an examination using ionizing radiation if it is indispensable that it be performed. Finally, the concept of Audit applies to the evaluation and monitoring of the descriptions of the justifications and clinical information to perform the exams. The application of Triple A in HCPA, in this sense, began in the year 2011-2012, through the analysis of medical justifications (clinical information) of the examination requests with the use of ionizing radiation of all clinical specialties. Based on the result of this analysis, the suggestion of training of the medical teams was presented to the HCPA medical director. The results obtained in the study period evidenced a 75% reduction in the requests for exams with inadequate justifications. Triple A became part of the Quality Assurance Program of the HCPA, with monthly evaluation of the indicator of noncompliance in justifications (clinical information) and awareness of the medical team, including qualification of doctoral candidates and medical residents in joining HCPA activities. In 2016 the application of Triple A was strengthened by the use of information technology to improve awareness of the importance of justification in the examination request. A criterion of restriction of characters was adopted in the field intended to justify the examination (the field must contain at least 15 characters), in order to encourage the requesting physicians to describe a medical justification with the maximum possible information related to the pathology of the patient. In June, training in radiological protection was started for 247 physicians requesting exams. The percentage of inadequate justifications was reduced from 20.6% (May) to 10.9% (June). In September, when the IT restriction was effectively implemented in the system of requesting exams, the reduction in the number of inadequate and / or insufficient justifications for exam requests was 6.0% (August) to 2.4% ( September). The remaining months of 2016 remained below 1%, as shown in Graph 1. Graph 1: Relation of the number of justifications (clinical information, in blue) described in the system and the number of inadequate and / or insufficient clinical information and their quantity in 2016 (in red). Graph 2: Relation of the number of justifications (clinical information, in blue) described in the system and the number of inadequate and / or insufficient clinical information and their quantity in 2017 (in green). Graph 3: Relation of the number of justifications (clinical information, in blue) described in the system and the number of inadequate and / or insufficient clinical information and their quantity in the year 2018 (in green). What was the acceptance of the campaign you developed with doctors? The campaign gained significant reinforcement in 2016 with the audit of the exam request also being part of the Quality Plan of the Radiology Service. The new proposal of work was presented by the Radiology Service and Permanent Commission of Radiological Protection in a meeting of the medical director and respective heads of service of the HCPA to optimize the medical justification in the request of the exams with the use of ionizing radiations. According to the acceptance of the respective teams, training in medical services was carried out. In the group of 54 medical and dental services of the HCPA (regardless of the probability of requesting exams), a total of 13 have been trained so far, reaching 247 medical or dental professionals. What can you say about the Orientation Guide you are developing today? From July 16 to 20, 2018, radiologists Drs. Tiago Garcia and Ronaldo Lucena from HCPA participated in the Regional Meeting on the Radiological Diagnostic Meeting for Health Care Authorities. Referral Guidelines to Avoid Unnecessary Exposure to Patients, meeting of the Technical Cooperation Program of the International Atomic Energy Agency (IAEA) RLA/9/085 “Strengthening Regional Capabilities for End Users / Technical Support Organizations on Radiation Protection and Emergency Preparedness and Response in Line with IAEA Requirements”. As defined in this meeting, the free translation of the Guide for the Prescription of Diagnostic Imaging Reviews by the IAEA Regional Program – RLA9067 – ATS 3, was adopted by the working group of the Hospital of Clinics of Porto Alegre and the National Nuclear Energy Commission. Since this document was edited in 2008 and the technology has been evolving significantly, in addition to the translation, the working group has identified the need to adapt to the current reality, as well as the guides or systems already implemented by the American College of Radiology and Canadian Association of Radiologists. It is also planned to make this guide available to Brazilian society in a digital version, using information technology whenever possible, to contribute to the national level to patient safety. How was the implementation of the Choosing Wisely Shares in HCPA? The goal is to improve the quality of care by collaborating for reasonable health choices. The HCPA has joined the Choosing Wisely initiative and promotes a campaign so that areas can pay attention and reflect on the theme: More is not always better. The application of Triple A in the justification of imaging tests using ionizing radiation is in line with the Choosing Wisely initiative: To optimize the use of diagnostic imaging resources to promote dialogue between professionals and patients. In a multiprofessional team action, the HCPA is promoting Choosing Wisely actions on the rational use of outpatient preoperative chest radiographs and chest X-rays in the ICU. Since the beginning of these actions, we have had a 12% reduction in the number of pre-operative outpatient chest X-rays and a 20% reduction in the number of chest X-ray requests in the ICU. These actions are based on collaboration between the medical areas concerned, changes in the IT system, awareness of doctors and communication campaigns.